Nest Protect is certainly a powerful and flexible bit of kit. You might wonder why you need a smoke alarm with so many bells and whistles, but when you realise what it can do it soon becomes clear why it's worth it. 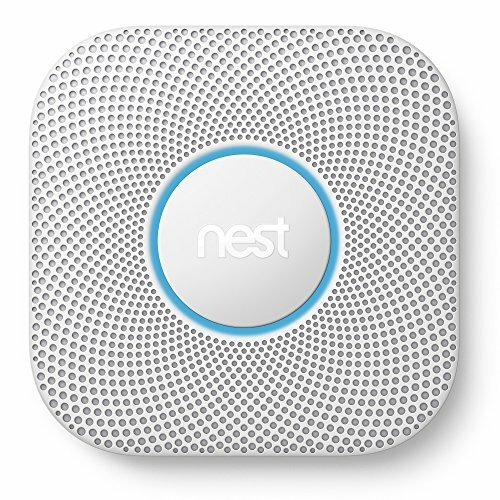 Nest Protect V2 is an updated version of the smart smoke alarm we've tested previously – some five years ago. This is an intelligent smoke alarm that ties into the Nest ecosystem and is packed full of sensors and technoloy designed to keep you and your loved ones safe. Netatmo smart smoke alarm vs Nest Protect: What's the difference? It's an expensive bit of kit though – so you're probably wondering if it's worth the outlay and if all the bells and whistles are worthwhile. We've been testing it out to let you know. Like the previous version, Nest Protect V2 features a stylish design, brilliant white finish and a bold lighting ring. It's likely far more attractive than your current smoke alarm. That beauty is much more than skin deep too. This Nest Protect comes in two forms: wired or battery-powered. We tested the battery supported version, which is probably the easiest to install and the most logical choice for most people (as the wired model requires proper electrical fitting – but at least it won't run out). This is powered by six AA long-life batteries that Nest say should last five years under normal use. Regular alarms or manual testing may reduce that lifetime, but they're easily replaceable should it come to it. Of course, the smoke alarm will notify you if and when the batteries get low – which is something a standard model can't do quite so elegantly. A yellow light and two beeps every sixty seconds, as well as notifications within the app, should be more than enough to keep on top of battery power to ensure the device functions as it should. Like your average smoke alarm, Nest Protect can be tested and silenced by a press of a button on the device itself. The ring in the middle doubles as that button and is easy to use. But the real power comes when you connect Nest Protect to your smartphone and integrate it into your smart home. If you have Nest products it's a straightforward process to add it into the Nest app and combine it with other devices. Scanning a QR code on the back pulls the device into the app easily and pairs it with your home WiFi. Installation of Nest Protect is a dream too: there's no drilling required because the device comes with self-tapping screws. As long as you have the right screwdriver they can be screwed right into the wall or ceiling with relative ease. No wall plugs, no mess, no fuss. The Nest interface is easy to understand too. Initial setup talks you through everything you need to know and the app is generally easy to use and packed full of info. Including what to do in an emergency. Nest Protect's design includes a Split-Spectrum Sensor that helps it differentiate between fast burning fires and smoldering fires. That means it can detect fires sooner than other smoke alarms and alerts you more quickly. It also means you get a quicker "heads-up" alert when smoke is initially detected. Nest says the sensor system also means that this smart smoke alarm is less prone to false alarms caused by burnt toast and other things that might cause a standard alarm to go off unnecessarily. The inclusion of a humidity sensor means Nest Protect can tell the difference between steam from a hot shower and smoke from a real fire. Nest Protect also includes a carbon monoxide detector built right into its body, meaning it's not only capable of warning you about fires, but also about the presence of noxious gas in the home as well. The system has a number of alarm settings for different situations. There is an initial heads-up alarm if a small amount of smoke is detected and it alerts you to such. This is good if food has been slightly charred as it works as an early warning to the alarm going off fully. A full-on emergency alarm is much more significant. A vocal warning and siren system alerts you to the problem and is very loud. Nest Protect not only sounds its loud 85dB siren during these situations but also uses its speaker system to vocally alert you to the problem. Audio cues include warnings such as "Please be aware. There's carbon monoxide in the (room name). The alarm may sound." or "Emergency. There's smoke in the (room name)." You can hear a sample of these warning voices on Nest's website. We find these accompanying alerts to be useful as it's more informative than a standard siren. If you have multiple Nest Protect devices installed around the home (which Nest recommends you should) then you'll easily know there's a problem and whereabouts in the home it is. Beyond the siren and speaker system, Nest Protect will also alert you via your smartphone. Push notifications right on your device and emails in your inbox mean you get notified of problems wherever you are, even if that's away from home. You can then open the app for more detailed information. Paired with a Nest Cam and you can look in on what's happening too. The Nest app also allows for full control of the alarm system from your device. You can test the system and check everything is working as it should be, receive notifications if there are any alerts, silence the alarm if it goes off and tweak settings. No more standing on chairs and waving a tea towel about to get it to switch off. On a monthly basis, Nest Protect can check its own alarm and voice system without any effort on your part. You can also force a full check if you feel more comfortable doing such things manually. A history of testing and checks is available within the app too. We're impressed with how Nest Protect has responded during our testing. We didn't get pestered when cooking sausages under the grill, but testing with a professional smoke alarm detector spray on multiple occasions set the alarm off as you'd expect. A short puff of spray just resulted in a heads-up while a longer spray set off the full alarm. Nest Protect is clever enough to notice when smoke dissipates too. It can tell when the smoke has cleared and will silence itself automatically. As well as the siren system, Nest Protect also features an RGB colour capable lighting ring that sits around the button in the centre of the device. When an alarm sounds, this ring lights up different colours to let you know what's happening. These lights work in a traffic light like system: a red light warns of a full emergency; an amber light tells of the pre-warning possible problems; a green light is a calming 'all is well' message; a blue light appears after tests or initial setup. It's also a multi-use light which functions as a nightlight when motion is detected. A fairly useful thing to have in your hallway for a nighttime trip to the bathroom. Additionally, there's a 'Nightly Promise' lighting mode where a green hue appears as you make your way to bed to let you know everything is functioning as it should be. It's worth noting that you can increase or decrease the brightness of Pathlight and Nightly Promise or turn them off altogether to save power if you so wish. Though in our opinion the functionality is well worth using, even with the extra drain on the batteries. This combination of lighting, self-testing and regular updates via the app mean you can always feel confident that Nest Protect is functioning as it should be. There's no nagging feeling in the back of your mind that you need to check the smoke alarm is still working, as Nest Protect does it for you. Nest Protect also ties in with other Nest products. If you have any Nest cameras – Nest Cam IQ or Nest Cam IQ Outdoor, for example – then the alarm can use those to capture a snapshot of the home when a siren is sounded. Ideal if you're not at home but need to see what's happening and alert the emergency services. This integration works in other clever ways too. If you have a Nest thermostat, Nest Protect will automatically shut off the heating in your home if Carbon Monoxide is detected to stifle the problem. Nest Protect is also compatible with IFTTT, meaning you can do other clever things with it too. IFTTT lets you setup intelligent pairing with other devices or simply set up recipes to make something happen if an alarm is detected. We really like this last one as it means the device could be used to protect those who are less hearing-capable. Seeing your home suddenly bathed in red lights makes for a pretty out-of-the-ordinary alert that something is wrong. Nest Protect is certainly capable of blowing its own horn. It's an all-singing, all-dancing, all-knowing smart smoke alarm that's a brilliant addition to the home. Tying in with other Nest products is an added bonus to an already brilliant system. The sensors in this smart smoke alarm are intelligent and allow it to differentiate between different types of smoke and mean it's not constantly going off unnecessarily. Peace of mind that comes with intelligent self-testing, carbon monoxide detection and simple things like Nightly Promise make all the difference too. In the end, Nest Protect is well worth every penny. Similarly priced, but perhaps a bit more understated, the Netatmo Smart Smoke Alarm is a viable alternative to Nest Protect. It doesn't have a carbon monoxide detector, but we did find it to be as capable as detecting problems with smoke while not bombarding us with false warnings. The Netatmo is also compatible with IFTTT and Apple Homekit, making it flexible too.